The lymph system is the "waste disposal system" within the body. It acts as the body's defense; it clears away toxins, bacteria, cell debris, excess water and proteins. The lymphatic system is essential as the body's drainage system for cleansing and filtering out of bacteria and toxins. Congested lymph pathways can cause soreness, aches, pains and flu-like symptoms. 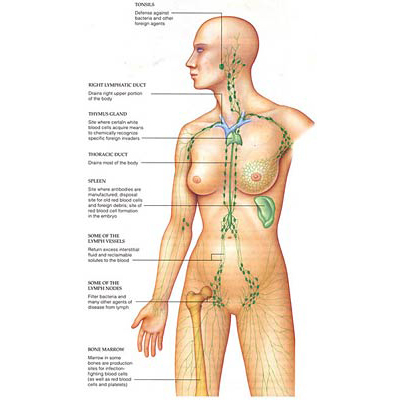 Lymphatic massage helps to unclog the lymph system. Beginning in a clockwise motion on the body, the lymph system is manually cleansed. Best performed in a series of four, or as part of a full detoxification program, this form of massage helps the body to heal itself from many common maladies. As with most massage, it is vital to drink lots of water after a lymphatic massage. Each person reacts differently with the first few treatments. Examples of this are: Fatigue, nausea, headache, bladder and bowel changes and some clients feel total refreshment and energy. This is all part of the expelling of toxins. If you have any queries, please do not hesitate to contact the clinic.